Hamburg, 21 March 2019. At the beginning of this year, Engel & Völkers opened its Market Center (MC) in the Greek capital Athens. The MC’s brokerage region also encompasses the Cyclades islands in the Aegean Sea with the internationally recognized island of Mykonos. “The Greek economy has recovered after years of crisis. Economic growth began late in 2016 and it is expected to resume in 2019. This economic development is also having positive effects on the property market. Buyer confidence in Greece has returned once again,” said Natalie Leontaraki, Managing Director of the Engel & Völkers MC Athens. Buyers from Europe dominate the market of Mykonos. The island is particularly popular with Germans, Swiss and Austrians. Prospective clients from Israel have also discovered Mykonos. The prime locations are in the villages of Chora, Tourlos and Aleomandra near Mykonos Town, as well as in the areas close to the beaches of Kalo Livadi, Kalafati and Ftelia. In 2018, prices for freehold apartments here reached as high as 12,000 euros per square metre. Villas sold for up to 8.5 million euros during the same period. 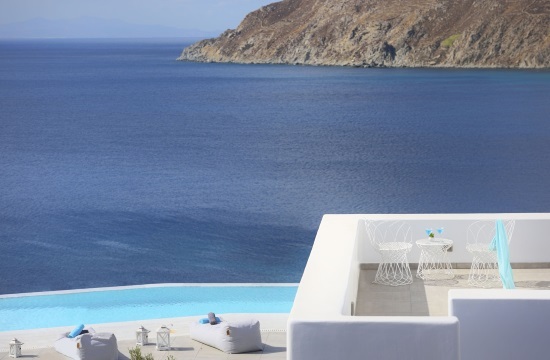 Real estate on the Cyclades island makes for a stable capital investment. “In a ranking of the highest returns – reaching 8 percent yields – from real estate investments, Mykonos is the frontrunner ahead of all the other Greek islands and the entire Mediterranean,” said Natalie Leontaraki. In the high-demand area of Tourlos, Engel & Völkers is currently brokering the exclusive “Villa Majestic” for 9.5 million euros. The Greek architect Christos Vlachos was inspired by ancient Cycladic architecture when envisaging the design for this residence. The combination of stone and wood brings a tranquil harmony to the open plan spaces with their large window frontages. A total of 700 square metres of living space host nine bedrooms and nine bathrooms within a 4,000 square metres land plot. The grounds feature an infinity pool and a Jacuzzi. 4) Luxury Travel Guide: Polis Hammam in Athens voted as "Best in Europe"